At the end of this article are several recipes for pasta salad and a coupon for Valentino’s Italian Restaurant in Reedley. I love pasta. It is a great invention and when I began to explore the history of pasta I wasn’t surprised to find it had an interesting past. I’d expected to read about Marco Polo bringing pasta in 1295 to Italy from his travels in China, because that’s what I’d learned in school. Marco Polo certainly did encounter pasta in China, though there are Italian recipe books that were written 20 years before Marco Polo’s historic travels that contain recipes for pasta dishes. When the Arab invaded Sicily in the 8th century they brought with them a dried noodle-like product that was a food staple in their country. From historical documentation and archeological findings pasta has been eaten in China since 2000 B.C. Though the pasta the Chinese ate back then was made from millet and not durum wheat. There are artifacts in the Etruscan caves that show a type of pasta like food eaten by these people much earlier than Marco Polo’s time. However, the Etruscans baked rather than boiled their dough. Then there is a clear reference to pasta in a debate in the Jerusalem Talmud of the fifth century about whether or not noodles violated Jewish dietary laws. And by the First century AD, Romans were eating a baked dish using a form of flour-egg based dough layered with meat or fish. So, as you can see pasta, in various forms, whether boiled, baked, made from millet or wheat flower has existed for thousands of years. 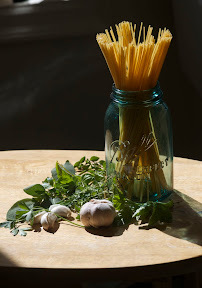 I believe that because it was easy to store in its dried state and could be carried from place to place that pasta became a perfect food staple. Pasta has only a few rules for cooking. Probably the main rule is to drop the pasta into boiling salted water. For those folks who need low sodium diet, add a squeeze of lemon juice or a tablespoon of vinegar to the cooking water instead of salt. The summer is a great time to prepare a large batch of pasta and set it aside to be used later. To package the cooked pasta for use at another time, cook as usual, drain, rinse the pasta under running water to take off excess starch, toss with a small drizzle of oil, and store in the refrigerator in plastic bags or a tightly covered bowl. If using that same day, the pasta does not need to be refrigerated. Never overcook pasta. The instructions on the package usually recommend cooking pasta between 8 to 12 minutes. If the water is at a full boil during the entire cooking time then 10 minutes should bring it to desired doneness. Most boiled foods continue to cook even after it’s been removed from the stove, therefore, to keep the pasta from over cooking and becoming mushy, rinse the pasta in a colander under cold running water which will stop the cooking process and also remove the excess starch and keep the pasta from sticking together. There are over 300 different shapes and varieties of pasta. Not only are there basic macaroni shapes, there is wagon wheels and bowties, animal shapes, small pasta shaped like guitars, fat pasta, and angel hair. Some pasta shapes are specifically designed to go with certain sauces. For instance the more highly textured the pasta the more sauce it can hold. Some varieties of pasta are large and hollow and designed to be stuffed. While other pasta such as angel hair is easily made gummy by too much or too heavy a sauce and requires a lighter delicate sauce and needs to be handle different from the standard spaghetti. The following summer pasta salad recipes could also be made with non-gluten pasta. My personal preference for this pasta is the variety made from brown rice. Follow the direction on the package for cooking time, but it is extremely important not to overcook non-gluten pasta. 1 cup per person of cooked Pasta of choice. 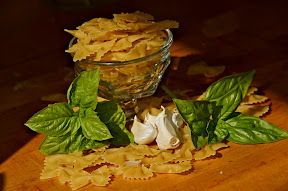 Flat pasta such as bowties works best for pesto sauce because it’s a sticky sauce and the crevices in the pasta will nicely hold small yummy portions of the sauce. Thoroughly rinse basil leaves, making sure that there is no dirt or sand hidden in any crevices. Grit is not tasty. Remove tough stems. Put the leaves and olive oil into either a blender of food processor and pulse until the mixture has become a thick paste. Add the garlic clove, half of the nuts (the portion of nuts that were not chopped), cheese and process again until the mixture is thoroughly blended. Put the amount of desired pasta into a mixing bowl and gradually add a tablespoon or two of the pesto sauce depending on your personal tastes for intensity of the pesto flavor. Mix well and taste to see if a bit more cheese is need, or perhaps salt. When the flavor is to your liking, mix in the remaining nuts. Garnish with a few basil leaves. This dish can be served right from the refrigerator but it has a fuller flavor if let to warm closer to room temperature. 1 cup per person cooked thin Spaghetti, the pasta lengths broken into approximately 3rds before cooking. Place sliced onions in a bowl. Mix in the lime juice, insuring that all of the onions are coated with the juice. The lime juice will cook or pickle the onion slices and take away the harshness of the onion flavor. Leave the mixture to mellow for about ½ hour, stirring several times to makes sure the juice is evenly distributed over the onions. Taste an onion to see if it is to your liking. 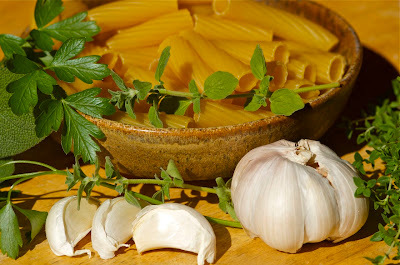 Combine the pasta, onion-lime juice mixture, mint leaves, the oil, and the other vegetables. Mix well. Taste and add salt if needed. *If you do not want to use the onion simply mix the lime juice with the oil and mix with the pasta, the vegetables of choice and the mint leaves. Toss together white beans, macaroni, minced garlic and herbs. Chill for about an hour. Combine the oil, orange juice, honey, vinegar, dried mustard and chili pepper. Pour over salad, toss and serve. Speaking of pasta, no one does it better than an Italian restaurant-treat yourself to Reedley’s own Valentino’s–their specials are listed on their Facebook page. Check out this special coupon for KRL’s readers! Margaret always makes me want to go eat all that food!!! Wonderful food writer! Great and informative article. As usual I enjoyed reading Margaret’s article.